There’s fresh news coming out of Germany today, Reds. Bild have reported that Bayer Leverkusen’s Julian Brandt – a former transfer target for Liverpool – has a €25 million release clause is his contract. According to the German newspaper, the 22-year-old could be available for us at a snip. A winger by trade, the young Germany international has actually been plying his trade in attacking midfield for the most part this season. You’ll remember that we tried to sign the Germany international in 2017, but as Goal suggested back then, he was worried about a lack of game time. Anyway, we can’t be too disappointed with how things played out: we went out and got Salah instead! 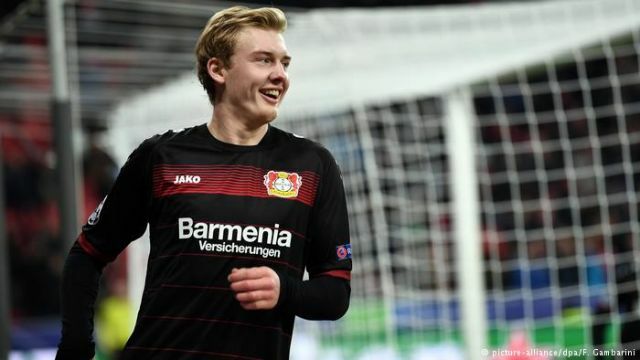 Leverkusen are sitting seventh in the Bundesliga, and Brandt could finally be convinced to link up with Jürgen Klopp and his Anfield revolution in the summer. We’d have to find a way to get him in the team though: a lack of guarantees for a starting berth is why he didn’t sign for us in the first place. That said, European glory and league titles might be enough to convince him to make the switch. His positional flexibility, pace, and trickery would make him a valuable addition to the team, as well as finally offering competition for Mané out on the left if needs be. With Firmino out for this week’s games after sustaining an injury in the Old Trafford game, and with Sturridge failing to impress in his stead, the future option that Brandt could represent would make him a canny bit of business for us come the summer. The substitutions on Sunday demonstrated that, despite our wealth of attacking riches up front, the drop off to Sturridge and Origi remains a yawning chasm. We’re going to need to improve our offensive options, especially since Shaqiri is struggling to regain the form that saw him score two against United back in mid-December. If we got Shaq for £13.5 million, £21.6 million for Brandt would be an equally decent bargain. We’ll likely face fierce competition for his signature if we do decide to go for him, but Klopp and Michael Edwards have proved that we’re a force to be reckoned with in the transfer market now. Forget Fekir, bring on Brandt!